Our Counting Scales feature the high accuracy AnD FCSi for parts counting the lightest components ensuring you have exactly the correct number of parts. Our equipment can be used as a standalone scale or linked to remote platform scales, bar code scanners, printers or even PC systems for inventory control. We are a distributor for all the major brands of counting scales including Salter Brecknell, A&D instruments, Ohaus, Digi, Adam Equipment, Straightpoint and Sartorius and many other brands. 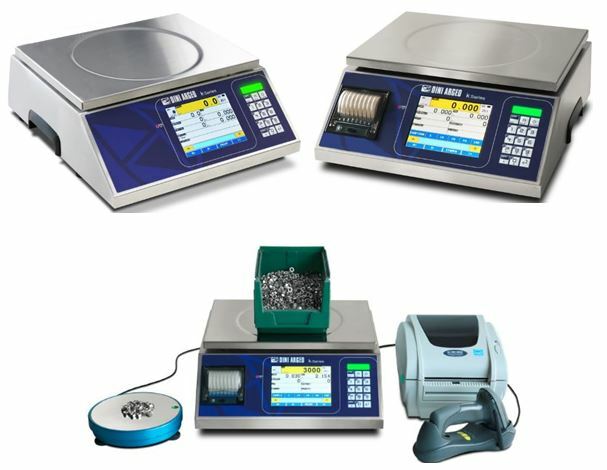 As an independent weighing scale company we are able to offer you impartial advice on which weighing scale will best satisfy your requirements at the right price. We are now introducing the latest in the counting scale range the “KST Touch Screen Counting Scale”, high accuracy configurable screen that can be tailored to suit your exact requirements, pictures of your components can be loaded to ensure easy operator interface with working on the display set to suit your specific needs. These can be used as stand alone systems or again linked to remote platforms, balances, bar code scanners or any of our PC packages. We now offer free “Bluetooth” software enabling data to be captured remotely (using on a fork truck for example to the operator does not need to dismount) on any Android device making this a very versatile system. Our range of scales can be supplied as battery or mains operated, working at stand alone machines or linked to remote platforms, printers or computers, the choice is yours. Depending on the components that you require to count we off high resolution upto 1 part in 10,000,000 using the Super Hybrid Sensor meaning you can count both light and heavy parts using one scale.